Thank you Teri and Mark for making our stay at Hidden Valley RV enjoyable. Our workamping experience was a great one. You guys have done a fabulous job on rebuilding the park after the horrible flood last spring. 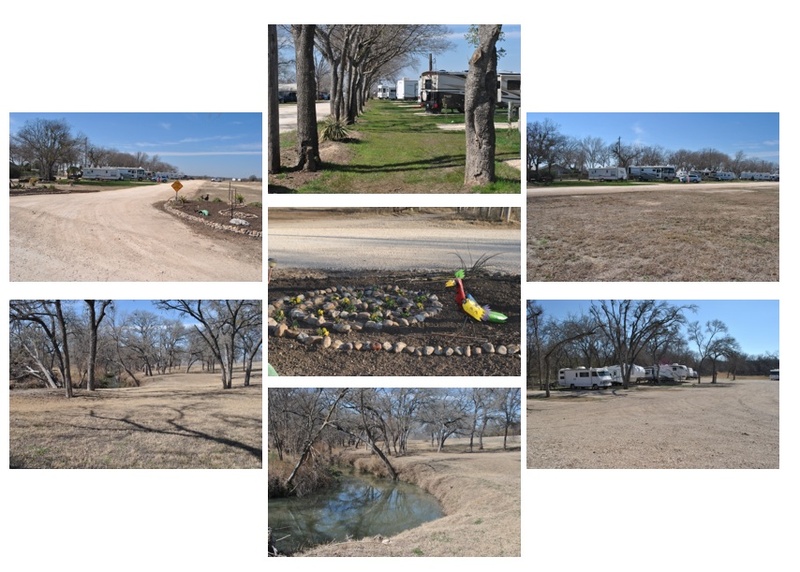 We landed at Hidden Valley on Thursday Jan 30th after a short drive up from Corpus Christi. Teri showed us site #2 pictured above. Carol’s sister Donna met us as we pulled in. The two sisters were going to have a sewing marathon for a day or two. As soon as we got parked, they took off leaving me to nest on the site. 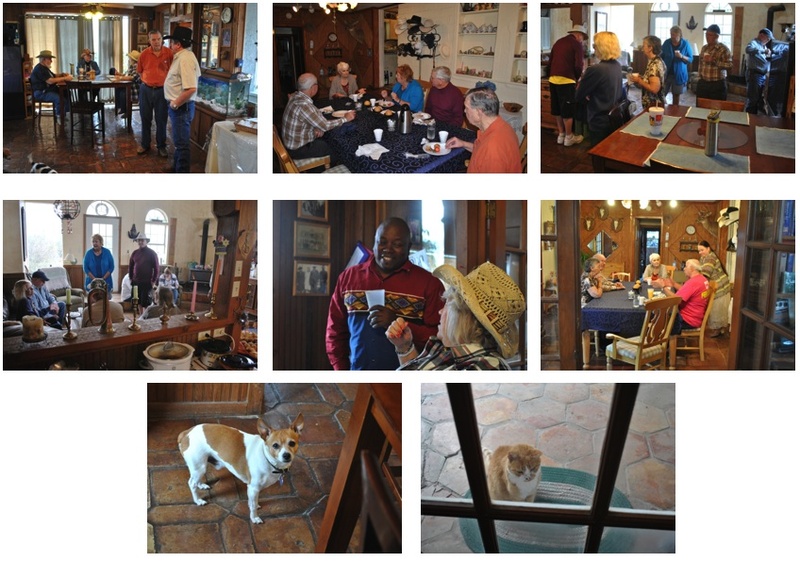 The sisters made it back on Saturday Feb 1, as expected to enjoy the Cowboy Breakfast, Hidden Valley was hosting. We had a grand time meeting new people and making new friends. Teri and Mark put on a feast that would fill any cowboy’s belly. Even the resident fur babies got into the action. After breakfast, I wondered through the park to catch a glimpse of the old and the new. The new sites are roomier and will have ample shade from the trees on the south side. Campers will enjoy that this summer. February 2nd was Super Bowl weekend. My niece Tammi invited us to come to their house. They were having a few friends over for a Super Bowl Party. We enjoyed our visit and meeting some of their friends. We did not get a photo of them so I borrowed one from Tammi’s Facebook page. 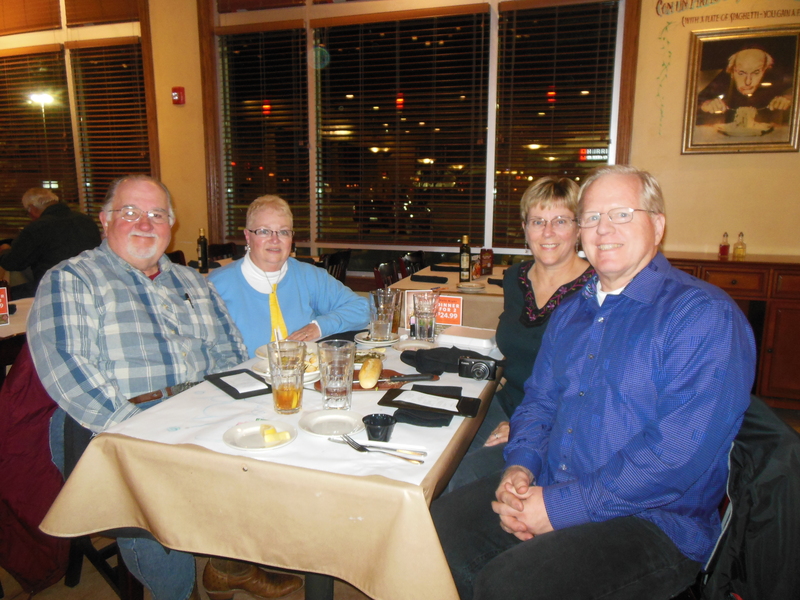 February 10th, we met up with RVers Bob and Susan from Oregon. They have an interesting story of how they got into this lifestyle. You can read that on the blog Susan writes, Travel Bug. We had a delightful visit at Zio’s in San Antonio. For Valentine’s weekend, Carol and her sister got back together for another sewing weekend. That gave me some more quiet time. I do enjoy that and I know Carol enjoys spending time with her sister. During that weekend our Calico cat, Patches, got mad at me. Apparently I went to bed on Thursday the 13th and forgot to check the water bowl. Cody drank it dry during the night and Patches got thirsty. When I woke up Friday morning, I could not find my glasses. After I took Cody and MeiLing out and got them fed, I went on a search for my glasses. I place them next to my side of the bed each night. This morning they were not there, not on the floor, not anywhere to be found. Since these were new glasses, I did not cherish the idea that I may have to spend another $250 for new glasses again. After I showered that morning, I saw something ‘shiny’ under a sewing accessory that Carol uses with her sewing machine. Eureka! I found my glasses. Apparently Patches moved them. Either that or one of the dogs did. I know I did not put my glasses there. Another mystery solved. We have had a combination of beautiful spring weather mixed with cold from the Polar Vortex that has been producing extreme cold in the US. 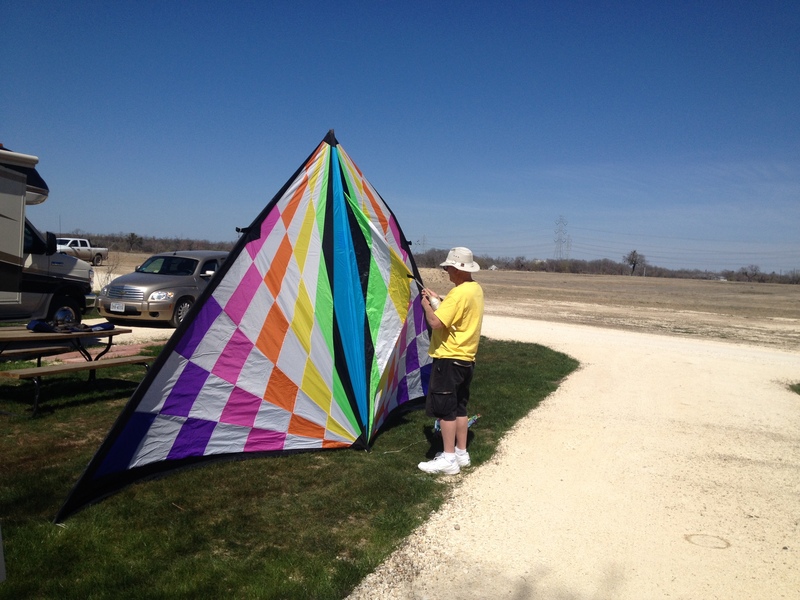 On those beautiful bright sunny spring like days, our neighbor John spends time flying his kites. He has quiet a collection of kites. His wife Carolyn says that it keeps him out of trouble. Here John is prepping one of his smaller kites. 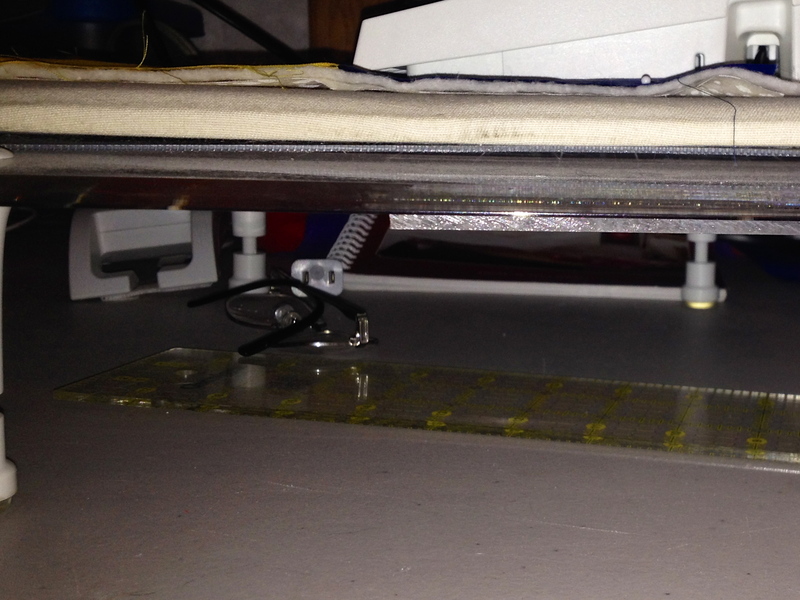 This one has a 20′ span across the base. Carol’s sister Donna and B-I-L Tom stopped by for a visit. They parked their travel trailer next to us. While the sisters worked on a sewing project, Tom worked on getting some repairs done on their travel trailer. We did not get any photos of Tom working on their TT but did manage to snag a couple of photos of the sisters’ sewing project from Hidden Valley’s FB page. On Saturday 2/22, Carol and I drove into San Antonio to meet another dear friend and former Driscoll Children’s Hospital co-worker. After Rebecca left Corpus Christi, she moved to Austin, Tx and met Ron. Rebecca and I chatted on Facebook but just never could arrange a meet up. She suggested getting together before we left San Antonio so we set a date. 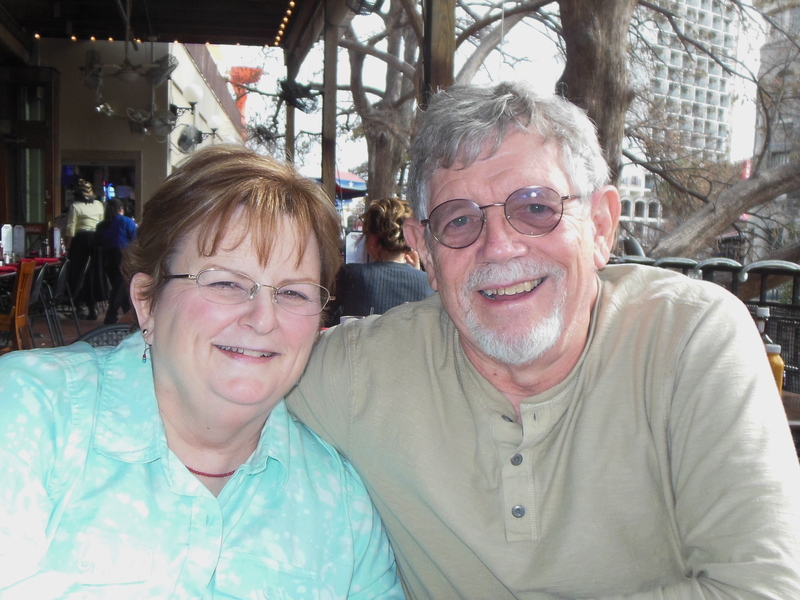 She and Ron drove from Austin to meet us at the Lone Star Cafe on the San Antonio Riverwalk. We enjoyed sharing our RVing experiences with them and talking about old times and how times have changed. Rebecca has recently retired from nursing and is enjoy this time with less stress. On Friday the 28th, we had one more lunch date with another former Driscoll Children’s Hospital co-worker. Linda White was benefits manager there until she left Corpus Christi had moved to San Antonio. Again, we’ve chatted a few times on Face Book which eventually led to a phone call to set up this lunch time. 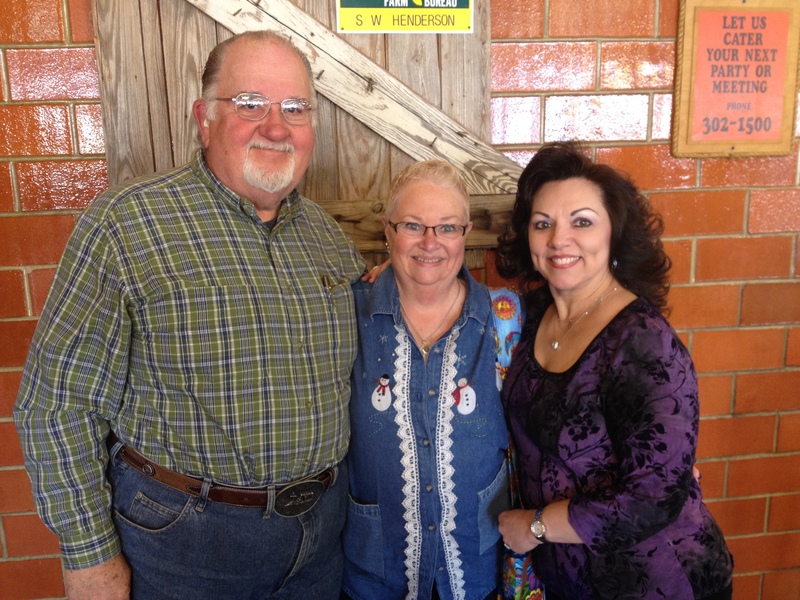 Carol and I met Linda and Robert at Bill Miller’s BBQ on the northwest side of town. We had a great time catching up on things. 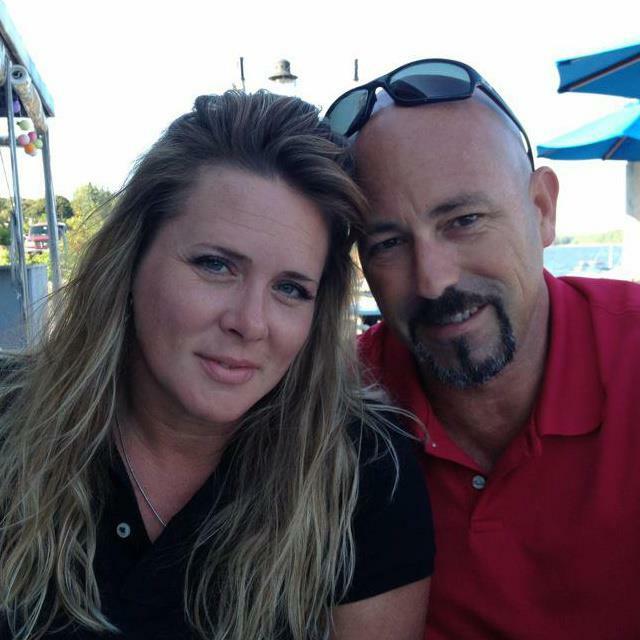 Linda and Robert said they make regular trips to the Tomball area and would come for a visit. As February comes to a close, several folks have asked what kind of work I had been doing. While Carol has been working with Teri in the office, I’ve been moving dirt. Part of this task is related to building up an area that washed out during the spring flood. The majority of the time was spent spreading dirt over areas in the field across from us that had large patches of exposed rocks. 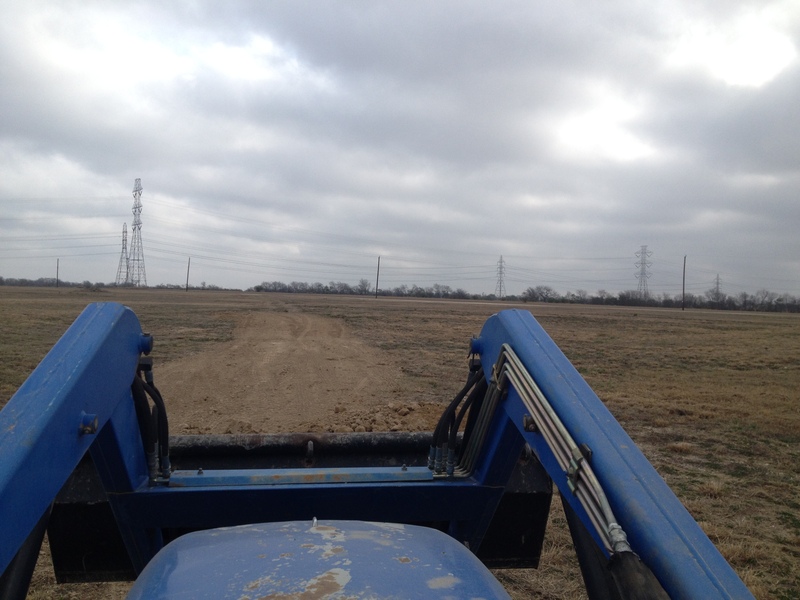 Mark wanted the field prepped for planting grass seeds. Just like a homeowner would do for their yard, spreading dirt means picking it up from one spot and spreading it in layers in other ares. The main difference is the size of the shovel. Here is the shovel I used. We did not do much sight-seeing while in San Antonio, but we did notice a new building that was quiet large. I just had to find out more about this building. Maruchen, Inc. produces 3.6 billion packages of Ramen Noodles in two plants in Irving, CA and one in Richmond, VA. They are currently at capacity and selected San Antonio as the location for their 4th Ramen Noodle plant in the US. 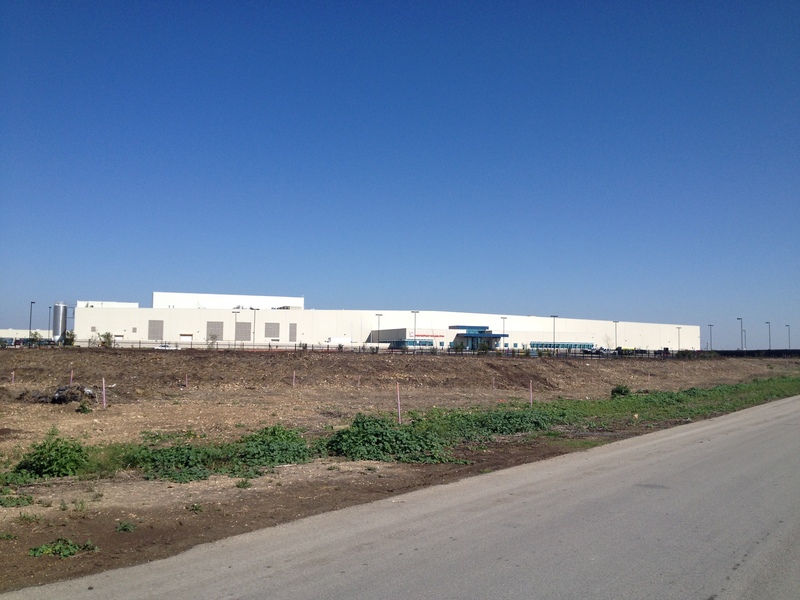 This 500,000 sq.ft building located near the intersection of I-35 and Loop 410 in Southwest San Antonio, is set to open later this year. Saturday was a travel day for us. We woke up to a heavy fog so we were in no hurry to leave. Carol had already cleaned up the kitchen so fixing breakfast was out of the question. 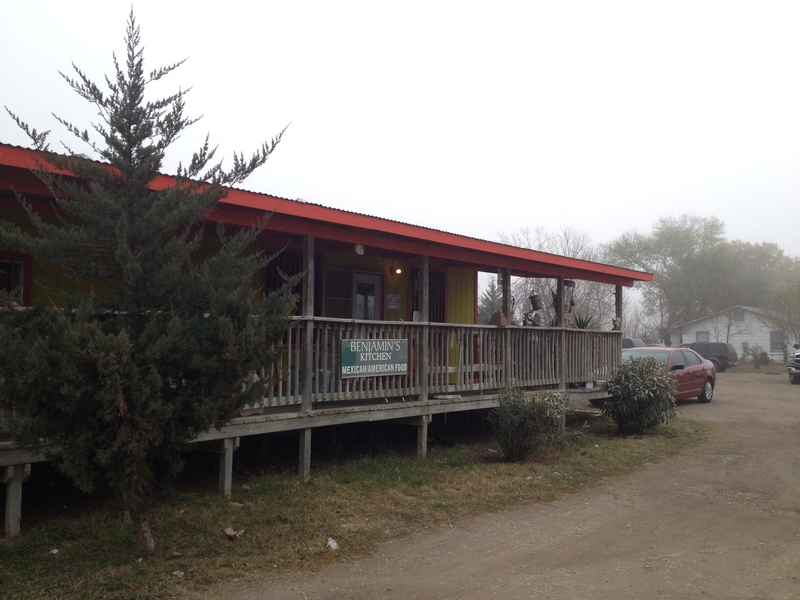 Instead, we decided to have breakfast Tacos at Benjamin’s Kitchen. This is not a fancy place. You don’t need a fancy place to be successful. Good food will draw a crowd. We arrived before the breakfast crowd and enjoyed our Tacos. By the time we left, every table was taken and people were beginning to wait for a seat. Thank you Benjamin’s Kitchen for the great breakfast Tacos. This entry was posted in Texas and tagged cowboy breakfast, ramen noodles. Bookmark the permalink. 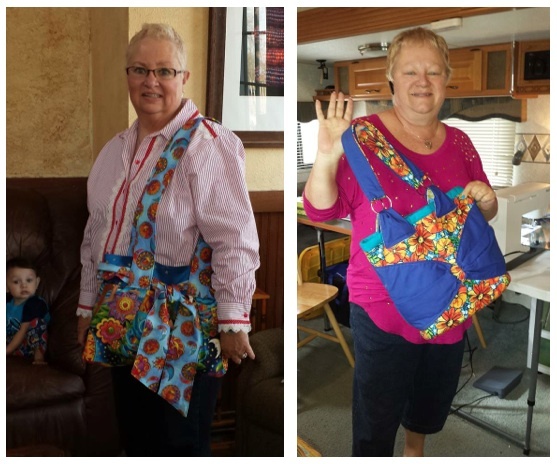 I recognize one of the fabrics in Carol’s purse – the bow fabric, I used it in one of mine. Lovely recap, Jerry. Glad you and Carol had the chance to catch up with old friends! So very nice to meet you both. Safe travels and we’ll watch for you on the road. Quite a re-cap of a mighty fine February. Hoping March is very bit as nice.